Brewdog do things differently. That much is by now pretty clear. But even when it comes to equity crowdfunding – in itself an unconventional form of fundraising – the craft beer specialists offer an alternative to the alternative. In 2013 Brewdog raised £5m via an equity crowdfunding round – without the assistance of an equity crowdfunding platform. Instead the rapidly growing company furnished its website with a tailor-made crowdfunding functionality, allowing its supporters to purchase shares directly from the website. True disintermediation, you might argue. And now “Equity for Punks” has returned – 5 times the size of the third iteration and undoubtedly an equity crowdfunding record in terms of its scale. Whether or not the record sits within the equity crowdfunding industry, having effectively circumvented the equity crowdfunding platforms themselves, is up for debate. At any rate, Brewdog is now looking raise a fresh £25m through the issuance of 526,316 shares. The minimum investment amount stands at just £95 – which will buy you 2 shares. The investment scheme has been approved by the UK Listing Authority – a specialist arm of the FCA. “The craft beer revolution has succeeded in redefining beer and Equity for Punks is redefining business finance, By making profit king, the financial institutions of the City gave rise to the bastardisation and commoditisation of beer. James and his colleague Martin Dickie founded Brewdog back in 2007 – quickly turning it into Britain’s fastest growing food and drinks brand. Brewdog has opened 27 bars worldwide since 2010, employs 360 staff and exports to 55 different countries. 2014 represented the company’s sixth consecutive year of growth, with annual turnover climbing by 64% to £29.6m from £18m in the previous year. But some questions linger. First and foremost around the types of shares on offer: B Shares. A closer inspection of the associated documentation reveals that these B Shares may be diluted by the issuance of further equity. Class A shareholders are not at risk of being diluted. The dangers of this kind of inequality were made explicitly clear in Mike Baliman's recent column: "Risk in Equity Crowdfunding: Oh Dear What Can the Matter Be?". Brewdog's valuation in relation to its revenues and particularly its profits also appears, to put it mildly, a little suspect. EU equity crowdfunding regulations dictate that no fundraise may exceed £5m in size, unless that campaign comes with a full prospectus attached. That’s the reason that no equity crowdfunding platform in the UK has ever hosted a project that has surpassed the £5m mark. But Brewdog has published a prospectus – a 66 page document that may be readily accessed from the company website. The solicitors RW Blears LLP have assisted Brewdog in readying its prospectus and ensuring that the fundraise is fully compliant. The Brewdog campaign is unique in other ways too. There are a plethora of rewards-options designed to sweeten the deal for investors. 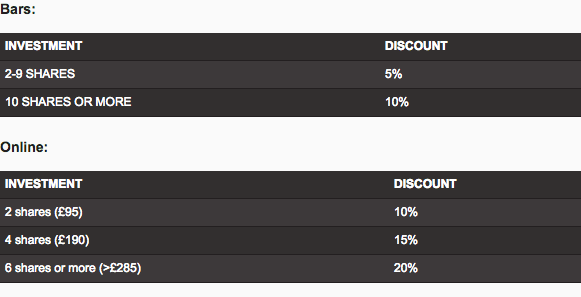 Let’s focus on the lifetime bar and online discounts. As the graphic below shows, regular Brewdog beer drinkers could buy just two shares at £95 and before long those shares will have paid for themselves, thanks to the 5% discount (a discount that doubles when ordering online!). This offering is not only on the table for UK investors. It’s also open to citizens from 28 different European countries. Given the power of the Brewdog brand, the colourful and various perks attached to share ownership, and the number of European markets from which capital may be sourced, we wouldn’t be surprised to see the £25m offering fully subscribed within a matter of months. Might such success persuade similarly in-vogue, established companies to raise equity capital from the crowd without the assistance of a fee-charging platform? That will be a worry for the equity crowdfunding sector, should “Equity for Punks” start flying off the shelves.